Finally! I was able to get the underwater camera pictures/videos from the Great Barrier Reef uploaded from the camera memory card. 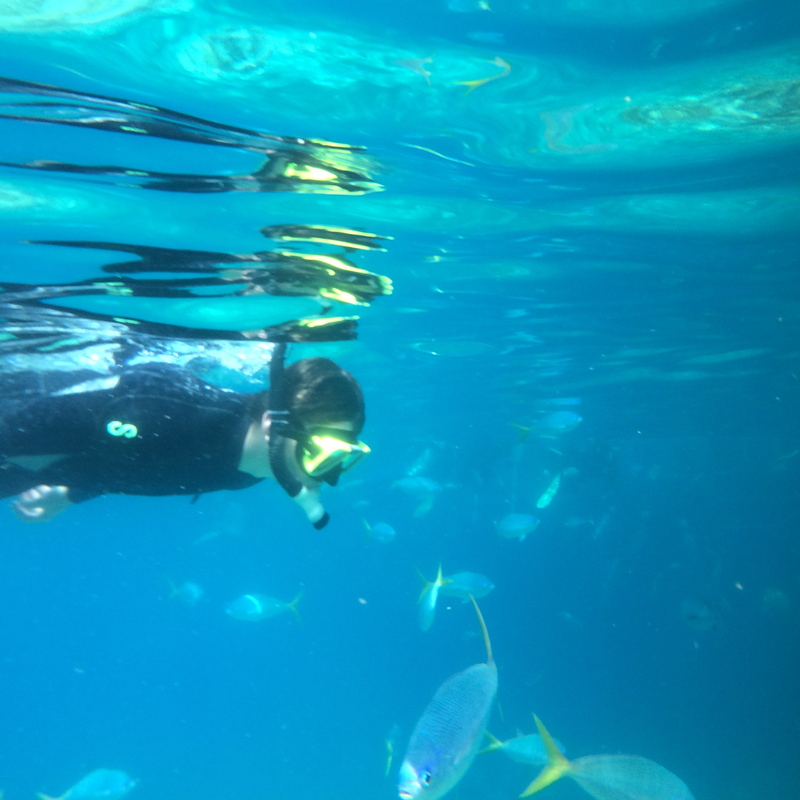 So as a break from the SE Asia posts, I present to you the scuba diving experience that was offered by Reef Experience out of Cairns, Australia. I would highly recommend the Reef Experience tour. It was well run, had enthusiastic and patient dive instructors, and offered some surprisingly good food and wine. I truly believe that a trip to Australia is not worth it unless you go to the Great Barrier Reef, so make sure to add time for it if you’re gonna travel all the way over there. There’s not much else to “say” about the reef, so please enjoy the videos and pictures. After our few days in Sydney, we took a flight to central Australia to get a taste of what the real outback is like (minus the Aussie Cheese Fries and Shrimp on the Barbie, which, by the way, Australians don’t say “shrimp” and they don’t cook them on the barbie). Ayers Rock is located about 3 hours flying time from Sydney and it was then that I realized just how big Australia actually is. Ayers Rock is home to one of the signature natural highlights of Australia — Uluru. From this point on in the blog post, I’ll call it Uluru as it is the indigenous name, whereas Ayers Rock was the given name by the Englishman who discovered it. How do I describe the Uluru? If you’ve seen Close Encounters of the Third Kind, image Uluru as a much larger version of that mountain that Richard Dreyfus is trying to reach and located in a New Mexico-like looking desert. Uluru is sacred to the indigenous aboriginal people and its place in their history is significant; it’s a place that is the site of ancient fables and there are certain parts of the rock that are prohibited from photographing. You can climb the rock, but you’d essentially be a massive douchebag if you did as they request that you don’t to respect the wishes of the aborigines. Aside from the legends that come from Uluru, the rock formation itself is an interesting geological formation. What you see of the rock is only like 10% of the rock; most of it is underneath the surface. So it’s like a massive land based iceberg of sorts. The best times to view Uluru are at sunrise and sunset. The sunset is the easy part obviously. Sunrise though — ouch. The Uluru tour picks you up at 4:30 am from the resort (there’s only one resort, I’ll get to that later), and drives you about 30 minutes to the rock. Now, despite the early hour, there are significantly better views as the suns comes up. It’s almost spiritual in a way as you’re driving towards the rock and it goes from a massive shadowy figure into the different colors as the sun comes up. Here’s a tip, when the tour parks for you to take pictures – stay at the higher point. That way you can look at the rock and see all the colors change, while at the same time see the sunrise behind you. We did not do this and missed out on the sunrise part. 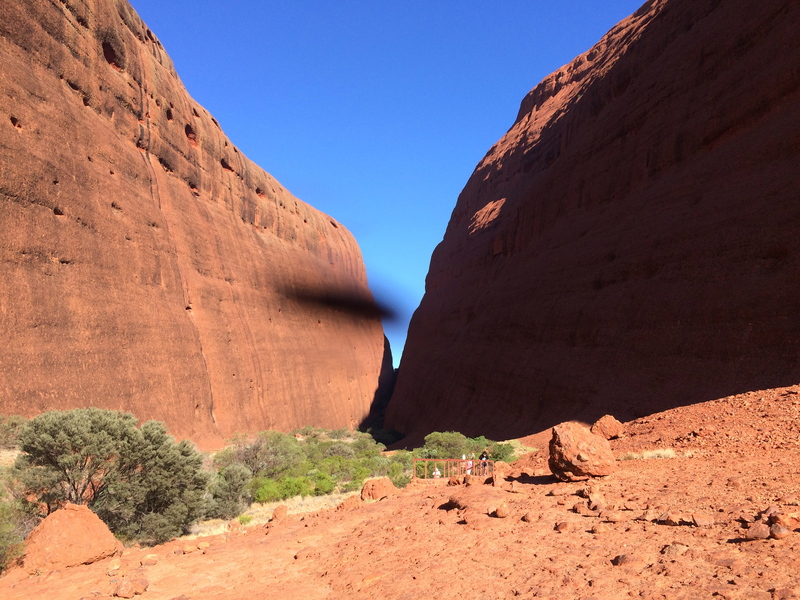 In addition to Uluru rock itself, you should go see Kata Tjuta which is another rock formation close by. Although Kata Tjuta isn’t as impressively unique looking from a geological sense as Uluru, we did see some wild kangaroos running around the crevice that the rock formations created. Here’s another tip. Actually it’s more of a warning. The flies. My god, the goddamn flies. They’re everywhere and pretty relentless. So, pack some bug spray, and if you desire, get a fly net to cover your head/face. This applies actually when you’re in any part of the Uluru area (airport, hotel, wherever). And here’s yet another tip. The shuttle bus ticket into Uluru park is $70 (on top of the $25 admission you’re already paying). If you’re in a group, just go ahead and rent a car. Even if you’re not use to driving on the left side of the road, you’ll figure it out, and its the desert so you’re really not gonna crash into anything (probably). Anyways, if you rent a car you’ll probably save money and you can come and go as you please into the park versus being stuck waiting on shuttle buses. At night, I would highly recommend doing the BBQ the tours offer. While the food wasn’t the greatest in the world (though it was perfectly good backyard BBQ), the real value of the BBQ was getting to sit with some Australians and getting to know the locals, which is something we didn’t get to do that much on the trip with all the moving around. Secondly — the stargazing. The stargazing is AMAZING in the outback. It also helped that we had a guide giving us a talk about the night sky with a legit (and I cannot stress this enough) lightsaber of a laser pointer. The laser literally made it look like the tour guide was Captain Kirk firing a phaser into the sky; that’s how intense the beam was. But with it, she was able to easily point out constellations and visible galaxies (yes, other galaxies) that we could see on the ground. Seriously, this was one of my highlights of the whole trip. And now my final point may surprise some of you. While I really enjoyed being at Uluru (especially the stargazing), I wouldn’t say that it’s a must-do. If you’re into geology or knowing about aboriginal history, then yes you should definitely go. But other than that, I wouldn’t sacrifice other parts of your trip to make your way out there. It’s not the cheapest excursion and I feel like you should make sure you way all your other options around the country before committing. Again, it’s a great experience, but in my opinion not a priority. There literally is only one place you can stay and it’s here. This resort is actually 4 different lodges for every socioeconomic tourist there is. The hotels range from a 4 star/high class hotel to a pitch your own tent campsite. There’s also a town center in the resort complex with a few restaurants, grocery store, and retail and a complimentary shuttle bus that drops/picks up hotel guests at each hotel. It runs throughout the day and evening. Because its the only place to stay, the resort is actually a pretty well oiled machine. We stayed at the Outback Pioneer Hotel which would best described as the motel of the resort complex (just one step above the campsite). The accommodations were perfectly decent; comfortable rooms and friendly staff. This hotel is actually the only one with activities that are geared for the younger crowd (outdoor bar, pool tables, arcade, etc) and the only hotel that offers take-away booze for sale, so that’s a plus. They also have a giant BBQ area with about 10 grills and they offer raw meat of all kinds (including kangaroo and crocodile) for you to grill up on your own. As I said, our second day was much more productive after a decent night sleep. We woke up quite early and grabbed a coffee by a nearby cafe (Australians love their coffee) and set off to do a circuit of museums before embarking on one of the highlights of Sydney – the BridgeClimb. Here’s a breakdown of the activities of this day. Forewarning, I’m not kidding when I said we did a lot this day, so this blog post will be a tad longer than usual. This ANZAC Memorial (ANZAC stands for “Australian and New Zealand Army Corps”) was actually supposed to be a quick time killer while we waited for the Barracks Museum (discussed next) to open. To our surprise, this memorial/museum ended up being one of the most interesting stops in Sydney. It’s at the south end of Hyde Park, you really can’t miss it, and it’s well worth a visit. The memorial itself is simple with only a Hall of Memory, Hall of Silence, and Well of Contemplation and the words on the ground simply say “Let silent contemplation be your offering”. On the exterior, in a place generally where you’d find gargoyles at an old church, there are sculptures of different types of ANZAC soldiers such as doctors, engineers, infantry, sailors, etc. On the bottom floor of the memorial is actually a free museum. The museum provides a really interesting view of the life of an ANZAC soldier throughout history (the WWII stories were of particular interest), along with personal stories, letters and other personal effects. After the ANZAC Memorial we made our way through Hyde Park, which is a lovely walk on a nice day, to the Barracks Museum. The price to get in is $10, but if you’re planning on doing two or more of these select museums — Barracks Museum, Museum of Sydney, Justice and Police Museum, or Susannah Place Museum — I’d recommend getting the Sydney Living Museums pass which is $18. The Barracks Museum gives a really nice history of how Australia started off as essentially a convict’s island and how the community built up from there. The building itself gives a look at living conditions back in those days and is surprising interactive, allowing visitors to try on different types of clothing, or take a nap in a colonial bed or convict hammock. The free audio guide is a nice plus as well. Pretty neat experience. Tell you something; I didn’t love this museum and probably wouldn’t recommend it. Yes, it gave us a look at some more history of Sydney, but it only really touched upon things here and there (no pun intended). The historical bits weren’t anymore in-depth than the travel guides we had. There were two bigger exhibits, one of which was a giant room where kids could play with Legos (admittedly pretty cool, but that did cost extra) and an exhibit on a couple of Australian architects who I never heard of with displays of their work, which if you’re into architecture maybe that’d be cool for you. There was however a cool theater in the museum which we sat in showing old 1940s documentaries on several things in Sydney, such as the building of the Harbour Bridge and such. But if you’re only in Sydney for a few days, I’d spend the time you’d spend here on something else. This is another free museum we went through on the way to the BridgeClimb. The museum is quite small, but it’s free so it’s a nice little place to stop in and see a little history about The Rocks area of Sydney and a learn a little more about the indigenous culture. One thing that really stood out about their displays was that the artifacts were in glass cases that also acted as touch screens. It was pretty neat, looked like something out of Star Trek. Outside the museum, you can find a lot of little shops and cafes that line the cobblestone streets. Just pressing on the glass at an artifact pulls up info. This was the highlight of the day, and one of the signature activities to do in Sydney. The BridgeClimb takes you to the top of the Sydney Harbour Bridge for some great views of the city and for bragging rights to say you hiked up to the top of the most iconic structure in Australia (there are a number of celebrities that they have photos of at the top who’ve climbed it). Now before you get any ideas, the walk up is not dangerous even though it seems like it might. You’re harnessed in, so you would literally have to unhook your harness, hop over a rail at your elbow, and sidestep like 3 yards to fall off. So don’t be too afraid to go if you’re someone who is a little afraid of heights. The guides are all excellent, have a great sense of humor, and provide some really interesting facts about the bridge, city, and Australia in general on the walk up (you’re wearing headphones that are connected to the guide’s headset). They offer walks at all points in the day, but it does get more expensive if you want to go at sunset and the price will vary depending on which arch you want to take to the top. They also go up even if it’s raining, they do make you take a breathalyzer, and you can’t bring your own camera, so keep that in mind. The day we went up it was cloudy and windy unfortunately. That being said, there was something to the unpleasant climate that kind of added to the “coolness” factor of going to the top of the bridge — it felt more like an adventure. I would definitely recommend checking it out (give yourself at least 3 hours in your day for it). So, there’s not a whole lot to say because we didn’t go in. It’s a really neat building though, and you do kind of have to see it if you’re in Australia. 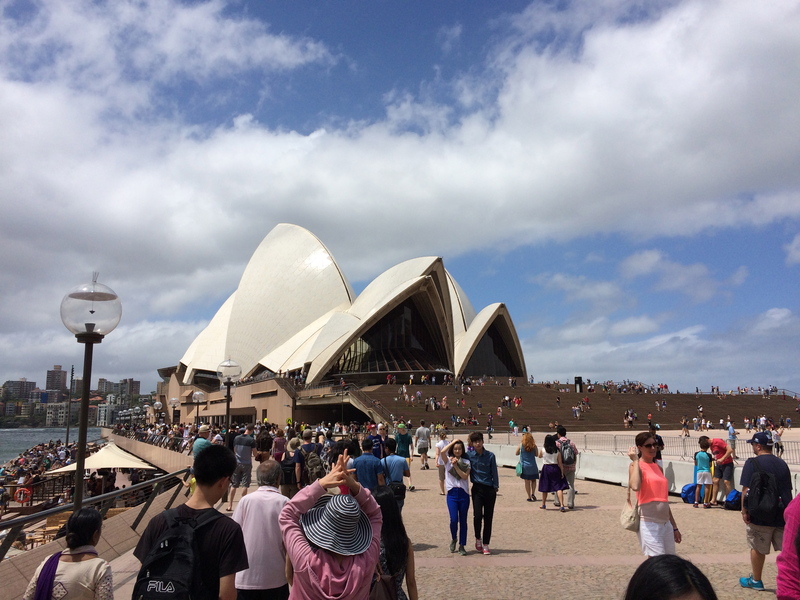 Unless you pay for a tour inside, or go in for a show, there’s not a lot to do outside the Opera House other than take some pictures and read about it in your guidebook. Actually a lot of what we learned about the Opera House we got from the BridgeClimb guy. We actually came here randomly because we were looking for a place to eat lunch that was near the Sydney Harbour Bridge before the climb. It ended up being a great place. It’s got good views of the harbour with a good amount of outdoor seating (like most of the restaurants along Circular Quay going up to the Sydney Opera House). They have a good beer selection of their own brews (I had their Little Creatures Pale Ale), and the food is pretty decent. The fish and chips I had were really tasty and unlike in the US and London, the dish is surprisingly not greasy. There was also live music playing for entertainment. Sydney’s Chinatown is certainly a hopping place, and the night we went it was super busy. It really felt like a going out place for people in Sydney. There was no shortage of places to get noodles, dumplings, etc. The place we chose was called Super Bowl Chinese and we chose it because there was a line 15 minutes long, so we figured it had to be good. And yes, it was good, and cheap in Australian standards (remember everything there is more expensive to begin with). But it’s not anything better than a good Chinese restaurant in the US, so I would go scouting it out, but if you end up there it’s not bad. Let me know if you find a really good place in Chinatown if you ever go and I’ll post it. Also, we stopped by the Australian-Chinese Ex-Services Monument because it had a bit of personal significance for my family. If you have a couple minutes, it’s on the edge of Chinatown on the way to Darling Harbour and something to check out real quick. You may or may not be aware, but Australia is in the middle of its summer around December, so when we arrive the country is in its nice and warm climate. However, the same months that it’s in summer also happens to be the same months as its rainy season. Sadly, during our time in Sydney it rained quite a bit. This did not dampen the time there however; we just ended up spending a little less time at the beach. Luckily Sydney offers plenty to do other than the beach (which we did visit at one point as you’ll read about later on), but the first day was spent getting our bearings and recovering from the jet lag a bit. Before I get into our zombie day of walking around, I just wanted to point out one thing about the Sydney airport. If you’re flying into the international terminal and want to get to the domestic terminal, you have to take a shuttle bus that costs $5.50. We weren’t alone in our flabbergast as most of the other travelers commented with astonishment and a fair amount of cursing for the fee just to go from one terminal to another (and if you’re thinking about walking, it’s not possible). So just a heads up. So back to the summary. We ended up wandering around to get a lay of the land. My initial reaction to Sydney was this – it’s very similar to southern California. That’s not necessarily a bad thing, but if you’re looking for something exotic when you’re traveling, don’t expect to get it from Sydney. Like most metropolitan cities, Sydney has commercial buildings, shops, restaurants, museums, busy city streets, and some parks. The best way I can put it is it felt a lot like San Diego. Our hotel was located in a very good spot (see details below), and gave us easy walking access to most of the parts of Sydney that you’d want to see in a few days. We also took the Sydney ferry from Circular Quay (pronounced “key” apparently) to Darling Harbor for only $6 — which, considering you pay $5 for a big bottle of water and $5.50 to go from a terminal to a terminal at the airport, is a pretty good deal. The ferry ride offers stops along different points on the harbor and provides fantastic photo opportunities of the Sydney Opera House and Sydney Harbour Bridge. Other ferries take you to places such as Manly Beach and other spots near the city. Like I said, our first day was just random wandering so I’ll just give you details of where we ate and where we stayed, and get into the more specific sights later on. It’s a miracle I’m even able to read my notes that I wrote on that day with my jet lag — they look like they were written by a gorilla on a trampoline. Before we left for Sydney, we heard from lots of people that there is a really good Asian cuisine scene. So, naturally for our first meal we wanted to try out some Asian food and we looked to our Lonely Planet guide for a lead. It pointed us to Din Tai Fung, which they said was a great, affordable place for good dumplings that locals love. Now in general, Lonely Planet usually suggests local places, backpackers venues, things of that nature when they give a one “$” rating. So when we showed up at an outdoor mall housing Din Tai Fung, we were pretty surprised at how “chainy” it felt. It wasn’t until later in the trip when I had wifi access that I was able to discover that, well, it was in fact a chain. Regardless, the food there wasn’t bad, just not great. The best offerings that they had were the soup dumplings, so I would stick to those, but even those weren’t the best I had ever eaten (that’s reserved for a few places in New York City’s chinatown). They did have a quote from Anthony Bourdain up that said, “I’d travel halfway around the world for Din Tai Fung’s soup dumplings.” Personally Anthony, I wouldn’t. Here’s a place I’ll say to just do take out. Don’t go there for table service. The service there was horribly slow. Yes, the waiter was friendly, but the service was so slow that whatever kindness the waiter had was kinda nulled out. Yes, it was Christmas Eve, but the place wasn’t that busy (no busier than any typical weekend night), so I can’t really give that as an excuse either. Our food, which was just a pizza, took an hour and a half to get to our table. They had lost our order so had to put it back in once we reminded them, but to add insult to injury, the people who sat next to us, who showed up far after we were seated, still got their pizzas before us. So why do I say just do take out? Because the pizza I had once we did get it and ate at the hotel (we had them box it to go and to give a tiny bit of credit they gave us a 20% discount for the wait) was really, really good. I had the Shanghai Pizza which consisted of roast duck, mushroom, snow peas, cashews, plumb sauce, and mozzarella. It was delicious — I really can’t find anything bad to say about it. So as you can see, there wasn’t a whole lot from Day 1, but Day 2 was much more productive. And that’s coming up. I have several friends who had visited or lived in Australia who provided advice on where to go, and what to do. My one friend, Beth, who lived in Australia for a year, had her own experiences which she emailed to all her friends and gave me permission to add to my blog posts. 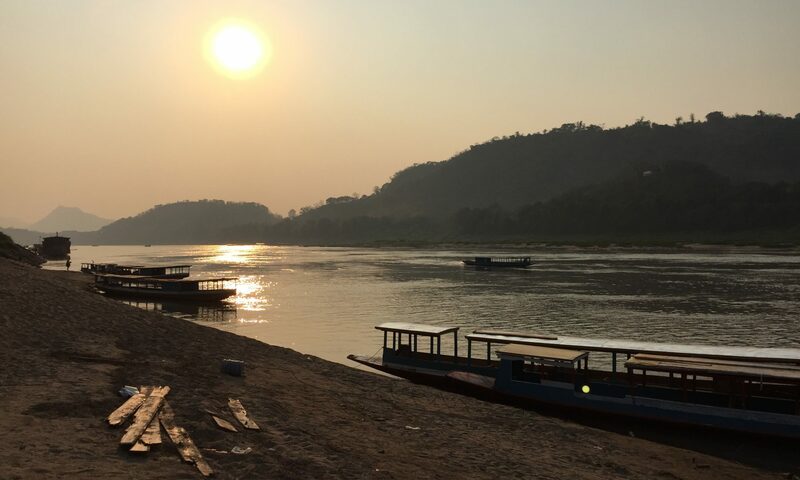 You can never have too many opinions when it comes to travel, and like I’ve said many times, this blog is meant to be as much for you as it is for me. So at the end of my Australia posts, I’ll be adding Beth’s tidbits in “Australia from Beth”. Note: Unfortunately, it was cloudy our first day. Better pics and weather for the next galleries. Hello all, I’ve returned. I know there was a bit of a hiatus there; 2014 was full of new things in my life (new condo, weddings, etc. ), so I’ve been slacking a little on the posts. 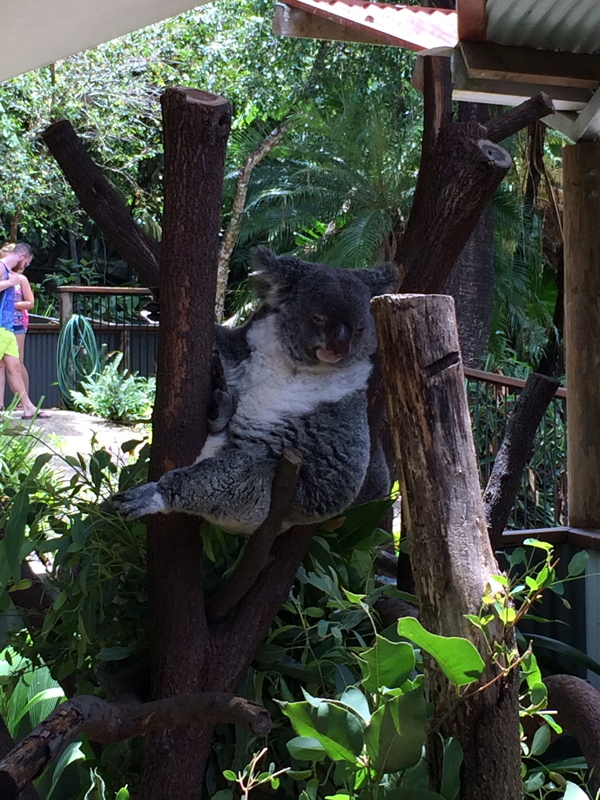 But it’s 2015 now, and I’m back to tell you about my past trip to sunny Australia! I don’t know many people who travel who don’t have the land down under on their bucket list, and it certainly was on mine. My time in Australia was wonderful, and compact – we did A LOT in the few days that we had and we hit up so many different types of landscapes that it almost feels like it was several different trips (city, beach, desert, ocean, rainforest). So it’s hard to sum up in one word everything we did. I will say that at every place on the trip there were a few constants about the people in Australia, the first being that I felt like Australians are kind of like the Bostonians of England. They’re very blue collar, down to earth folks who also don’t pronounce their “R”s (Car is pronounced “cah” for example). Everyone was also friendly (which is where the Boston metaphor kinda goes away). Regardless of how cheesy Paul Hogan is in Crocodile Dundee, his demeanor is a spot on representation (at least in the people I encountered). I also noticed this about Australia that I’ve never seen anywhere else — there are A LOT of Asians in Sydney. Now, I don’t mean that I’ve never seen a lot of Asians in a city. What I haven’t seen really is a Caucasian nation/city with such an integrated Asian society. Sure, there are a lot of Asian Americans in Los Angeles and San Francisco, but even there it feels like they kind of live in their own world. In Sydney, I didn’t sense any sort of separation at all – it felt like one really fused culture in one city. Again, I only really saw this in Sydney, and I’m not sure if Melbourne and the other parts of the country are similar or not because we didn’t make it there. But at least in Sydney, it was a very apparent blend and a new experience. I legitimately felt right at home in a weird way. Here’s a not so good observation about Australia. Everything is expensive. Getting there is expensive and being there is expensive. This is not a scenario like going to Southeast Asia where you pay an arm and a leg and then everything is cheap once you arrive. Food, drinks, lodging, tours — everything is pricey. The Australians get by because they get paid higher on average, but you don’t get the salaries they do, so be prepared to shell out. Now, the trip to Australia is a long one. When you’re traveling from the US east coast to Australia, the whole trip will take around 20 hours (About 6 from New York to L.A. and then another 14 from L.A. to Sydney). Here are a few things that’ll help that length of travel be a bit more comfortable that I learned. Tip #1: DO NOT wear dry fit underwear. My initial thought process was that it would be a long flight, so maybe it’d be more comfortable to wear that Under Armor underwear for the travel. I was wrong. Yes it was dry and cool down there, but it was relatively uncomfortable after awhile because the elasticness would ride up constantly when you’re sitting. So stick with the cotton underwear with Gold Bond. Tip #2: Bring a small bottle of face wash soap in your carry-on. I had prepped for the teeth by packing the toothbrush and toothpaste in my carry-on, but didn’t account for my face. After like the 12th hour of not washing my face, it just felt really greasy and gross and all I wanted to do was rinse off. I was wary of using the airplane soap because I have sensitive skin and didn’t want to breakout. If you don’t have that problem, maybe that’ll be okay for you but for the rest of us, don’t forget the face wash. Tip #3: Don’t go with Qantas Travel to put together your itinerary as your first choice (Qantas Airlines on the other hand was decent). Now look, if you do, they weren’t “horrible”. But they did screw up a couple things, like not giving us a code to a lockbox that had our hotel keys for our stay in Cairns (I’ll get to that later when I talk about Cairns), leaving us out on the sidewalk with our suitcases late at night. So based on our experience, I’d look at other options if you’re going to book your travel to Australia through a travel company. I’ll get into Sydney, Uluru/Ayers Rock, and Cairns/Kuranda in my next few posts. Happy reading and happy new year!